Copper Poisoning is the accidental or intentional intake of copper containing compounds. Copper is used in the manufacture of electrical wires and cables, jewelry, antimicrobial compounds including fungicides and insecticides, in marine applications and structures, etc. What are the Causes of Copper Poisoning? What are the Signs and Symptoms of Copper Poisoning? Chronic exposure to copper, especially in an industrial setting, can result in severe symptoms and lung, liver, kidney, and neurological complications. Individuals with the genetic condition glucose-6-phosphate deficiency disorder are also at a higher risk for severe symptoms and complications. How is First Aid administered for Copper Poisoning? Who should administer First Aid for Copper Poisoning? 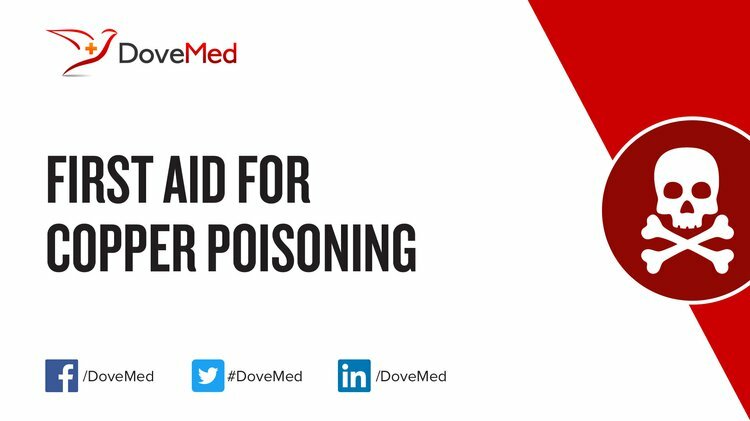 First aid for Copper Poisoning is administered by healthcare professionals. What is the Prognosis of Copper Poisoning? How can Copper Poisoning be Prevented? Gamakaranage, C. S., Rodrigo, C., Weerasinghe, S., Gnanathasan, A., Puvanaraj, V., & Fernando, H. (2011). Complications and management of acute copper sulphate poisoning; a case discussion. Journal of Occupational Medicine and Toxicology, 6(1), 34. Cao, Y., Skaug, M. A., Andersen, O., & Aaseth, J. (2015). Chelation therapy in intoxications with mercury, lead and copper. Journal of Trace Elements in Medicine and Biology, 31, 188-192. Suttle, N. F. (2012). Copper imbalances in ruminants and humans: unexpected common ground. Advances in Nutrition: An International Review Journal, 3(5), 666-674. Hallenbeck, W. H., & Cunningham-Burns, K. M. (2012). Pesticides and human health. Springer Science & Business Media. Chinedu, S. N., Nwinyi, O., Oluwadamisi, A. Y., & Eze, V. N. (2011). Assessment of water quality in Canaanland, Ota, Southwest Nigeria. Agriculture and Biology Journal of North America, 2(4), 577-583. Djoko, K. Y., Paterson, B. M., Donnelly, P. S., & McEwan, A. G. (2014). Antimicrobial effects of copper (II) bis (thiosemicarbazonato) complexes provide new insight into their biochemical mode of action. Metallomics, 6(4), 854-863. Edgar, J. A., Colegate, S. M., Boppré, M., & Molyneux, R. J. (2011). Pyrrolizidine alkaloids in food: a spectrum of potential health consequences. Food Additives & Contaminants: Part A, 28(3), 308-324. Purchase, R. (2013). The link between copper and Wilson's disease. Science progress, 96(3), 213-223.